Farm Fresh Meat: Would The Law-Abiding Cyclist Please Come Forward? Would The Law-Abiding Cyclist Please Come Forward? I have, against my better judgment, engaged in debates with members of DC's cycling community on local blogs. From time to time. These discussions are usually sparked by an accident between a cyclist and a car, and generally without any solid details on the actual circumstances surrounding said accident, a bunch of people will immediately rail against the driver. They will call for inquisitions, hangings, and protests. The assumption is, without exception, that the motorist is at fault. The problem is, cyclists break laws all the time. But in the course of these discussions, these avid defenders of the impossibility of a cyclist being at fault in an accident refuse to admit this. Rather, they claim that the cyclist-scofflaws are the "exception," the bad eggs that give the vast majority if the cycling community a bad name. Anyone who leaves their house more than once a year knows this is, simply, a crock. The reality is quite the opposite: cyclists who actually stop at stop signs and red lights are the exception. 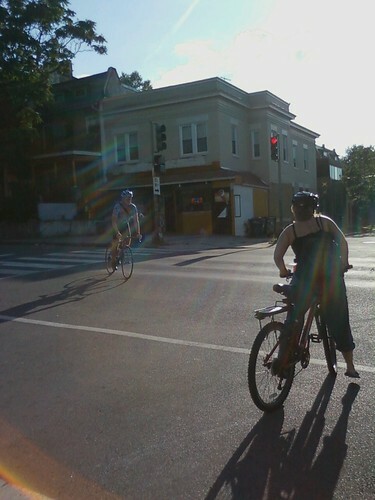 Today, I spent about 15 minutes at the corner of 14th and Park in Columbia Heights taking videos of cyclists. Not a single cyclist waited for the light to change before proceeding. The reason I chose this intersection is because it's unquestionably not safe. There is construction going on. It's a complex intersection where Kenyon, Park, and 14th all converge in a mayhem of traffic lights. There is tons of pedestrian traffic. I also included one shot I took last week in Adams Morgan, where I was initially inspired to conduct this little video collage by the shocking frequency of light-runners I saw. Spend two minutes watching the video as every single cyclist blows through the light, despite the presence of construction equipment, cars coming from all angles, pedestrian traffic, and cops directing traffic. I apologize for the awful quality. Cell phone video technology leaves a lot to be desired. But even so you can clearly see all the cyclists ignoring the light while pedestrians wait on the corner. In a couple of the shots, you will see traffic coming northbound (on my side of the street) while a cyclist goes south. They are still running the light - those cars are coming from Park Road. You can't easily tell in the crappy video but the light is always red when you see a cyclist crossing Park. Also note pedestrians rarely cross against the light while every cyclist does, and further that there's actually a traffic cop standing on the opposite corner of 14th and Park throughout the whole time. So, cyclists, would you care to explain how these people are merely the rare exceptions to an otherwise law-abiding group of citizens? Would you like to explain why even the pedestrians generally saw fit to wait for the lights to change at an intersection that is clearly unsafe, but not one cyclist did? As a (reformed) cyclist, I'm also getting frustrated with this. I stop at red lights until they turn green and this is certainly the exception to the rule. The thing I have come to realize after I stopped running lights is that it's really not any faster to run them. You might gain a total of 1-2 minutes in getting to your destination. But, the real time saved riding a bike in the city (versus a car) is in having a much more direct route (no parking search, door to door to your destination, passing traffic when safe and legal, etc). The red light running doesn't save much, if any, time. Often when I'm on my bike, I'll just end up catching up with the cyclist running the light at the next light anyway. In effect, running the light only gets you to the next busy intersection a few seconds faster. The real advantage of riding a bike in the city is not running lights. If you're a cyclist that is in the habit of running lights, give stopping at all lights a shot one day. You'll probably notice that you get to your destination as the exact same time. Jamie - I think its worth distinguishing between stop sign and stop light behavior, though. Its often safer and more efficient for everyone involved for the cyclist to stay on the bike (slow roll) and yield properly at a stop sign. Again, this slow roll and yield sadly doesn't happen most of the time, but its far safer for all parties than a cyclist coming to a complete stop at a busy four way stop intersection. I my experience, this epidemic isn't just a DC thing. In any area I've been to with people cycling on streets they do not abide by the laws, especially the red light laws. They don't realize that they are slower and smaller than cars, and just because they think its safe, doesn't mean some car who didn't see them make come out of nowhere going faster than they anticipated. There's a reason cyclists are obligated to same laws as drivers. You're more than welcome to continue bashing cyclists in the city. But, I didn't see one of them even close to a car, a collision, or even endangering anyone. Until there is proper regulation of cycling vs driving, proper bike lanes/signals, this is going to continue to happen. It's not nothing new, it happens everywhere. For me, it's often safer to run a light to gather a little bit of distance between you and the mass of traffic behind. I imagine car drivers even appreciate the lack of congestion of car traffic compounded with bikers. @Anon 9:58 PM, the argument you make is the same one which is always made to defend breaking the law -- I'm not hurting anyone. The point of traffic laws is not for the 99.99% of the time that nothing bad would happen when you run a red light. It's to ensure proper traffic flow, and safety at ALL times. If you would argue it's OK for cyclists to run red lights whenever they want, then why wouldn't it also be OK for cars to do the same thing? An automobile running the red light in every situation observed above, also, would not have come close to a collision or endangered anyone, either. Yet I don't see anyone arguing that cars should be able to decide when they should or should not ignore the law. As long as you (and others) continue to argue that the law does not apply to you, because you perceive there as being no problem, cyclists will have no credibility and the "cause" will be hurt. Just because cyclists are a minority as a type of vehicle does not exempt them from the same laws. Motorcycles and scooters have the same physical dynamics as a bike as far as visibility and maneuverability, yet nobody is arguing they should be allowed to routinely ignore traffic laws. Why not? What makes you so different? This attitude needs to change. Until then, most people will simply not sympathize with cyclists, and why should they? All we see is blatant flaunting of the safety regulations that the rest of us must abide with. This video shows that unquestionably. Until most cyclists decide to obey the laws it's hard to want to go out of your way to make special considerations. "It's often safer to run a light to gather a little bit of distance between you and the mass of traffic behind." I keep hearing this as an excuse for running lights and for snaking between stopped traffic at lights. Has it ever occurred to you that when you do this, all the cars who just passed you before they stopped for the light (and you didn't) will just have to pass you again? I really don't understand how putting yourself in the position of being passed by a whole bunch of cars who (like you should have) waited for the light to change, is better than not doing that. You observe a few bikers going through a red light and conclude all bikers run red lights. Not a very convincing argument. @Anonymous, I actually did what could reasonably be called a miniature survey. In fifteen minutes' time, at a fairly dangerous intersection, I saw about 10 cyclists run a red light, and zero cyclists wait for it. Would you be convinced if I sat out there for an hour and counted? Do I need to get out a statistics book next? No, it was not a scientific study. But I suppose you think I just happened to pick the one time in the day when all the bad cyclists got together in Columbia Heights? Obviously, my observation means something. If you believe that this was just a phenomenal coincidence, and in fact I just happened to witness an event of unthinkable unlikeliness that will never happen again, then you are seriously deluded. My "sample" may not be big enough to say exactly what percentage of cyclists run red lights, but it's big enough to say that a great deal of them do. I bike. I stop for red lights. The vast majority of bike commuters I see stop for red lights. My observation and my experience mean something too. The majority of bikers obey the law. The difference between your observation and mine, though, is that I have proof of what I observed, and you do not. The statement that "the vast majority of bike commuters stop for red lights" is an absolute crock and you know it. I challenge you to repeat my experiment anywhere, anytime, and show me these so-called law abiding cyclists. your "proof" is a video of bikers on a street. You claim they are running the red light but how do we know the light isn't in fact green? I stand by my statement - I stop for red lights. The majority of the bikers I regularly commute with down 14th or 16th street stop at red lights. You have your video of a few bikers, I have my years of experience commuting by bike. Sure, some bikers go thru red lights. And some cars don't come to a complete stop at stop signs or before turning right on red. Some pedestrians cross when the sign says "don't walk." Dude, seriously? How do you know the light isn't green? Um, that would be because of all the CARS that are NOT going through the intersection the way the bikes are. You can't see them stopped there when the bikes keep going? Cars do not normally just stop at a green light. And before you say it, they are not waiting to turn - there is no legal left turn there, Park Road was one way westbound because of construction. Not to mention the cars coming across the street on Park Road from the east, the other way, before and after you see bikes run the light. I believe you stop for red lights. I have a very good friend who bike commutes every day, and also stops for red lights. I do see people in the wild do it once in a while. But most do not. But you are a sample of one. My point is that many people, the vast majority, do not. And that is what the video shows. I said nothing about you personally and I applaud your desire to not break laws. It doesn't change the fact that a great deal of other cyclists do, which results in a lot of people having the generally accurate impression that a lot of cyclists don't give a crap about the law. You have your opinion about bikers and red lights (most break the law), I have mine (most obey the law). You won't convince me you are correct and neither will I persuade you I am right. Thanks for being the voice of reason in this debate. I am glad that you took time to document what so many bikers fail to admit, that they regularly disobey traffic laws. This topic never seems to go away. Whereas I agree that it strains credulity for someone to say that only the rare cyclist breaks the law, Jamie seems equally naive. The vast, vast majority of drivers break the law. Stand at any intersection with a stop sign and see what fraction come to a complete cessation of movement as required by law. Particularly if they are turning right, at a time when there is no one around. I think most of us wouldn't go crazy about rolling through a stop sign on a deserted street. Why? Because the driver is very unlikely to hurt anyone. It doesn't mean that they aren't breaking the law, it just means that it doesn't much matter. I hear often that for cyclists to get respect on the road, they have to follow the rules of the road that apply to them the way they apply to cars. While seemingly incontrovertible as an argument, the implication would seem to be that, since cars break the laws with staggering freequency, cars should not be allowed on the road. Funny, that isn't typically the point people are trying to make. @Anon, I'm not sure why you think I'm naive. This post is about cyclists, not cars. I didn't say that cars never break the law. In fact, I said nothing about cars. Certainly cars roll through stop signs, I have never disputed that. But cyclists roll through stop signs all the time, too. So both guilty. However, I think it is at all naive to say that the vast majority of cars do not run red lights. That is what this post is about. When is the last time you saw a car come up to a red light, look both ways, and drive right through? I've seen that maybe twice in my life and it's been in the middle of the night both times. My point is that cyclists take for granted that it's OK for them to run red lights, whereas one in a million drivers would ever do such a thing. And there's a reason. It's a hell of a lot more unsafe then rolling through a stop sign at a couple miles per hour. If you don't think it would be OK for nearly every single car on the road to do this, then why do you think it's OK for bikes to do this? There is a difference between rolling through stop signs and running red lights. Your argument seems to be that because cars do not adhere to every single traffic law 100% of the time, then it doesn't matter at all that cyclists break them all with staggering frequency. You might as well say that because a lot of people litter, then it's OK to rob banks. They are both illegal after all. Cars break laws all the time. Switching lanes without using a signal is breaking the law. Not wearing a seat belt is against the law. Excessive use of a horn is breaking the law. Where do you get the impression that car drivers are law abiding cherubs and bicyclists are sons of Lucifer? Yes, bicyclists run red lights. People jaywalk. If you're not used to it, than move back to Kansas. Jesus, why are you even having this conversation? This site has succeeded in boring me. @This Mac, as I said in the first paragraph, this post was predicated on discussions with cyclists who believe that it is a near impossibility that a cyclist could be at fault in an accident because cars are all reckless scofflaws and cyclists are not. I've never argued that cars don't break laws. My point is that cyclists do so as well, and they don't just do the only slightly dangerous things that cars do all the time (like not signalling, and rolling through a stop sign), they do much more dangerous things, like running red lights routinely. Therefore, when it comes to debating fault in an accident in the absence of an eyewitness, the idea that it's certainly the cars fault is pretty silly. As far as my blog, if the site bores you, I think you know where the door is.